It’s always wonderful when form and function come together, and that is exactly what frosted glass graphics provide. Frosted glass window film mimics the look of specialty glass, adding privacy and texture while allowing natural light to pass through. Films are available in a large variety of textures and opacities, enabling you to create translucent geometric and custom patterns to heighten privacy and provide the appearance of etched glass at a fraction of the cost of actual etching. Also, because the film allows natural light to pass through, it helps create an “open” feeling. The film is easy to cut to fit any window and is typically applied to the interior window surface. You can also create shapes and other laser cut design elements to carry your brand visuals throughout the space, again without sacrificing privacy or light. It is durable, yet easy to remove, so it is ideal for both permanent “owned” spaces as well as rented facilities. The applications are endless. 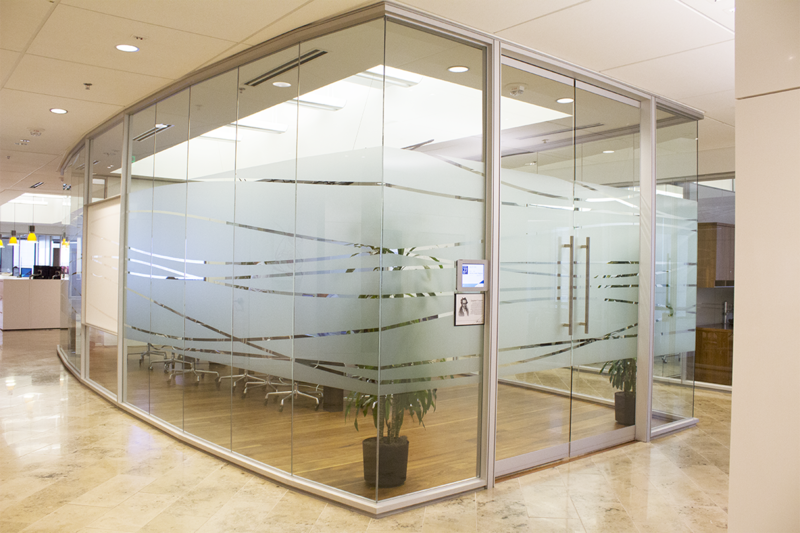 You can add aesthetic appeal and branded elements to any and all glass surfaces including conference rooms, lobbies, retail storefronts, private offices, glass partitions, and wherever there is a need for decorative privacy. In all cases its adds a simple, yet elegant finish that is both eye catching and functional. Window films could very easily be mistaken for cling wrap, and looked like you were sticking the package your lunchtime sandwich came in to your office window. However, over the past few years, innovations in window tinting technology have made it look more interesting, smarter, and even more stylish. Below are some of coolest innovations in window film, which may hit wide distribution in the future. Thanks for the information. sounds so great and helpful. Kudos!